20) Income of Foreign Institutional Investors from securities referred to in section 196D] etc. 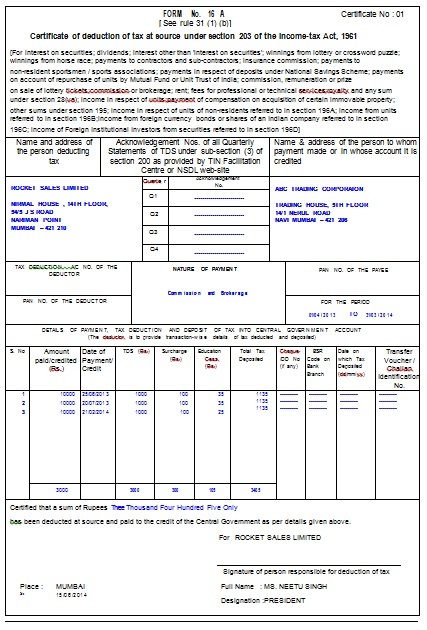 In these payments company has to make payment after deducting TDS @10% ( If PAN No of the party is available), @20% ( If PAN No of the party is not available) Or as per Declaration given by the party ( i.e. For Mizoram Party no TDS deduction is required). The amount deducted as TDS is deposited to government by the company. At the end of Financial year the company has to issue a Certificate of TDS Deduction ( Form 16 / 16A) to the party. Against the receipt of this Form 16 / 16A the party adjusts its Total Income tax payable liability with the amount deducted in Form 16 /16A. There are many free online word to pdf converter websites where you can convert your Form 16 A word File into pdf format. I have upload a Fully Filled Sample Form 16A Format in word. You can download it from here & edit the fields in blue colour as per your requirement.